Despite State of Michigan monitoring data indicating that Flint has been meeting Federal Lead Action Levels for nearly 2 years, and other independent data supporting that official result — a mantra that Flint water is still too dangerous for drinking (even after lead filters) or bathing continues unabated from some quarters. For outsiders perplexed by the irreconcilable discrepancy between what the scientific data shows versus claims of the “citizen engineers” who want to disrupt expertise/communities, we herein outline a typical week of misinformation flowing from some of the usual suspects: Dr. Laura Sullivan (FACHEP/Kettering), Activist Melissa Mays (Campaign for Lead Free Water) and Jordan Chariton (Independent political reporter). Dr. Laura Sullivan (FACHEP) emails a large group of scientists, expressing concerns that water treated by lead filters in Flint schools is not safe for children. Dr. Sue Masten (FACHEP) and George Krisztian (MDEQ) point out that the data she was citing came from unfiltered water, and it was collected more than 2 years ago before lead fixtures had been replaced throughout the schools – in fact, all of the filtered water samples collected from the schools had undetectable levels of lead. This is just the latest example in which Dr. Sullivan looks at good monitoring data, and somehow fools herself into thinking it is really bad—at least this time she did not publicly state a conspiracy theory that that the State of MI and the media have something to hide, and do not care about children. Mays then takes the photo, and makes a new posting with the text “Is this photo from 2015? Nope. Yesterday. But “experts” tell us our water is “restored” and “normal.” REALLY? Drink up, then.” This photo and caption goes viral and is shared by Dr. Sullivan and Jordan Chariton. FlintWaterStudy shows that the photo supposedly taken June 27th, 2018, was actually from 2015. Mays disputes our irrefutable evidence, and repeatedly asserts the photo was actually taken on June 27, 2018. The location of the hydrant is stated to be Martin Luther King and Flint Parkway. 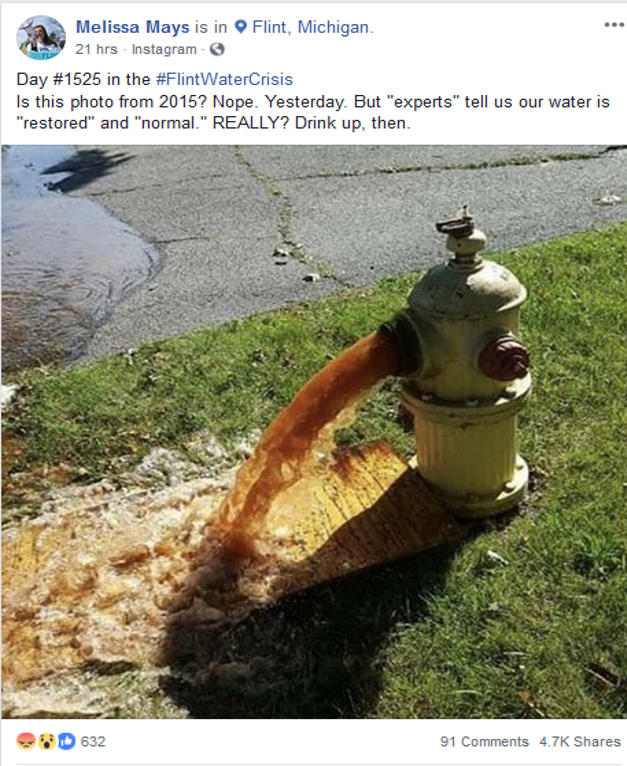 Perplexed by Mays’ continued insistence that the photo was from 2018, Flint resident Keri Webber goes on a quest to try and find the hydrant that was supposedly spewing the horrible water reflecting “legal genocide.” A summary of her Facebook live posts that day, affirm the position of FlintWaterStudy that the photo was actually from 2015. Flint resident Florlisa Fowler also confirms the photo is from 2015. Melissa Mays posts on Facebook that “Arsenic has been detected in my water….” She further posts that her doctor told her “transdermal absorption of lead is an issue,” and provides a written citation from a reference supposedly supporting that. We fielded calls from those who read Mays posts and were worried about drinking arsenic contaminated water and getting lead exposure through the skin. It turns out that her reference also states that “absorption of inorganic lead is minimal” through skin—and since lead in Flint water is 100% inorganic residents need not worry about absorption afterall. Consistent with what the authorities have been saying all along. For those who were worried about May’s report of arsenic, we looked back at over 2,800 potable water samples collected during our sampling events in Flint since 2015. The highest was 3.9 ppb measured at the tap, where higher arsenic is to be expected because it is used in brass. The Federal standard of 10 ppb is measured at the treatment plant, and we always found undetectable arsenic in those samples. The average arsenic of 0.8 ppb in taps from Flint homes is lower than the typical U.S. water supply (Frey and Edwards, 1993). Once again Keri Webber goes back into the field to confirm that the photo is NOT from 2018, but the photo is reposted multiple times anyway. The on-going battle between “citizen science” versus “citizen engineering” in post-Federal Emergency Flint continues, raising questions that should haunt all Americans. Do facts matter anymore? Are all “Truths” really equal? And if the tactics of the science anarchists operating in Flint, successfully undermine expertise and disrupt the community, spreading fear, hate and social anarchy-what then? Flint still has very real problems, including a water infrastructure financial crisis, that gave rise to the Flint Water Crisis in the first place. The on-going conspiracy theories, misinformation and fearmongering, make it virtually impossible to constructively address those problems. Why did I recently read an article that some flint public schools plan on NOT using they drinking fountains this fall when school begins again. Why is there no mention or testing of bacteria levels?? While I firmly believe that there are problems with the drinking water in flint. 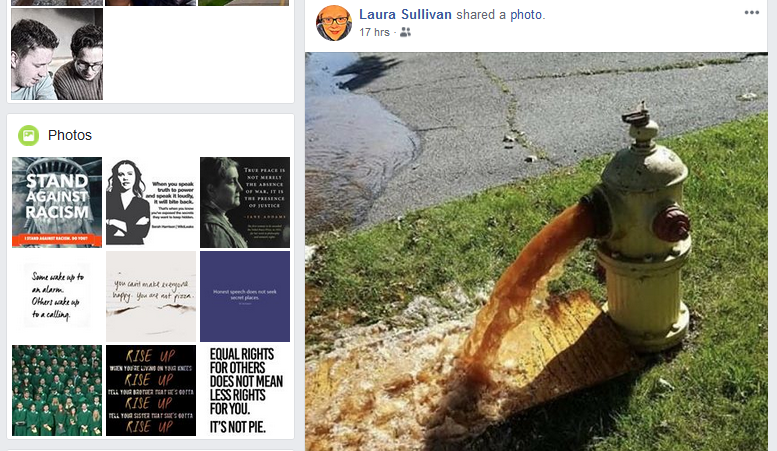 Using a photo of water coming out of a fire suppression system system will not make for the argument that the water is poison. The water in hydrants sit stagnant for a very long time inside a metal piping system and in no way, shape, or form is that water potable. The argument to be made is at the tap of water service to a home/s. Every fire hydrant that get s flushed yearly looks like this.